It feels like sport headphones are proliferating. It's hard to say why — maybe more people are getting into fitness, maybe they're becoming easier to make, maybe they're just lucrative. "Athleisure" fashion is a thing, certainly. It could be that people just want the core features of modern sport headphones: Bluetooth, waterproofing, mic input, and comfort. Phrased that way it makes perfect sense. Some sport headphones are notoriously expensive, but they don't have to be. Enter the Tarah, which replaces the Freedom 2 as Jaybird's "budget" alternative to its flagship X4 headphones. There are some tradeoffs we'll get into, but first it's worth talking about how similar the products are. To look at them you'd think they were identical. 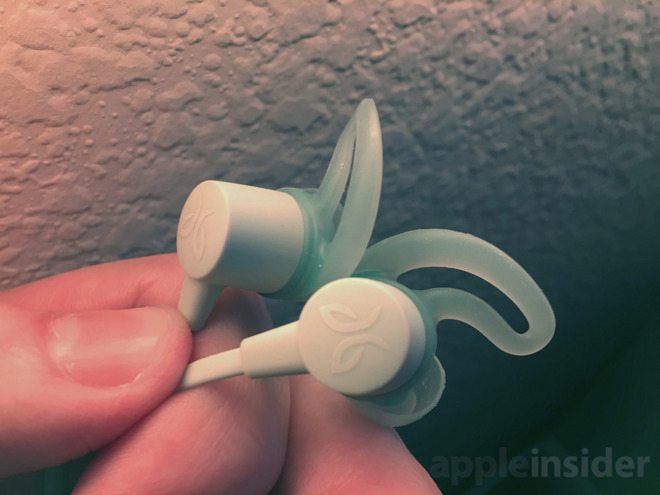 The buds and straps are essentially the same, as is the shape of the fins that keep them in your ears. If you have older Jaybirds, you'll appreciate that the rounder, thicker shape of the current fins makes them more comfortable and sturdy. 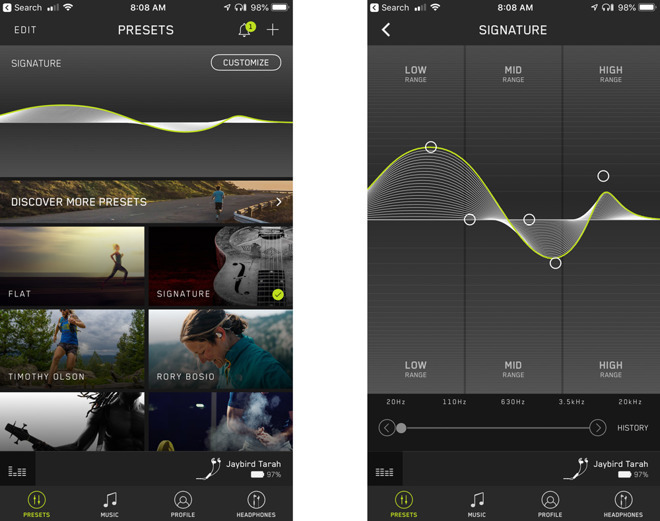 Like the X4, setup and configuration involves pairing through a device's Bluetooth settings menu, then customizing the EQ through Jaybird's iPhone app. The headphones are tuned flat by default — while they actually sound decent that way, you'll want to pick a preset or adjust ranges manually. You can (and should) do this while music is playing for instant feedback. Here's where differences begin to manifest. I preferred the "Signature" and "Bring the Bass" presets on the Tarah to my choice of "Extended Listening" on the X4. That should seem odd on the surface, because both headphones have a range of 20 hertz to 20 kilohertz. As I tested the Tarah though, I came to realize that I had better fit and sound isolation with them. That's a little odd, since you can't customize them as much as the X4, which comes with three fin sizes, two sets of silicone tips, and two sets of Comply foam tips. The Tarah not only drops foam options but fuses the fins and silicone tips together in three sizes. In my case, though, this seemed to keep the buds better sealed and firmly in place, not only shutting out more outside noise, but improving the punch from bass. Combined with solid tech specs, I was so impressed that I'm legitimately debating whether I want to go back to my $200 Powerbeats3 headphones. Those are easier to pair with Apple devices, and I find hooks more secure than fins, but to me the Tarah sounds clearer than any Beats product I've worn. What might stop me is battery life. The Tarah has a maximum 6 hours, which in my experience was just enough for three workouts. That's half what the Powerbeats3 offers, and 2 hours less than the X4. 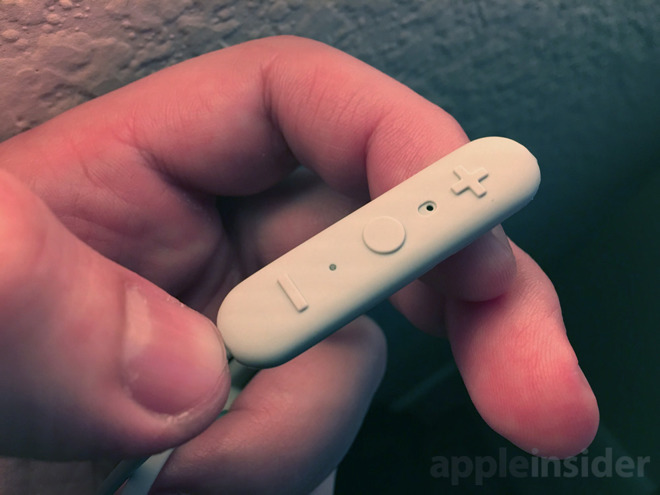 Jaybird also insists on making you use a proprietary USB charger, which means you're SOL if you lose it or want to charge in multiple places — you can't buy extra ones on the company's website. The cable on the accessory is ridiculously small too, suggesting that Jaybird expects it to hang from your computer. If you're a marathon runner or at the gym four-plus days a week, you may be better served by something with a more powerful battery. It's no fun charging multiple times per week, especially since people sometimes remember right before they're headed out the door. Assuming you can live with that though, the Tarah may be perfect, especially since they're a whole lot cheaper than anything Apple makes. Jaybird's Tarah wireless sport headphones are available in three color combinations with each retailing for $99.99. Amazon carries the Nimbus Gray/Jade and Black/Flash color combos with orders scheduled to ship on October 9. Best Buy is also accepting preorders for the Solstice Blue/Glacier in-ear headphones with free shipping.